The National Assembly passed a bill on Nov 17 to form a special prosecution unit for investigating the scandal surrounding Ms. Choi Soon-sil. 196 voted in favor of the bill while 10 voted against and 14 abstained1. The 10 “nay” votes came from members of the pro-Park camp within the New Frontier Party (NFP). – Alleged dereliction of duty. 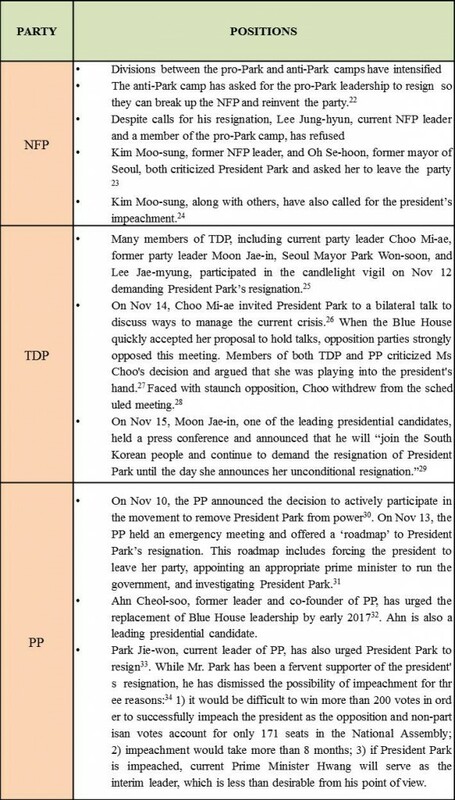 Woo Byung-woo may have failed to perform his duty as Senior Presidential Secretary for Civil Affairs at the time and allowed Choi’s intrusion into the president’s decision and activities. One of the criticisms regarding the special prosecution team is the failure to single out the most important subject for investigation: President Park.5 Others have suggested, however, that the team has the authority to expand its investigation to cover other related issues. This may include an investigation into President Park’s “missing 7 hours” during the sinking of the Sewol ferry on April 16, 20146. 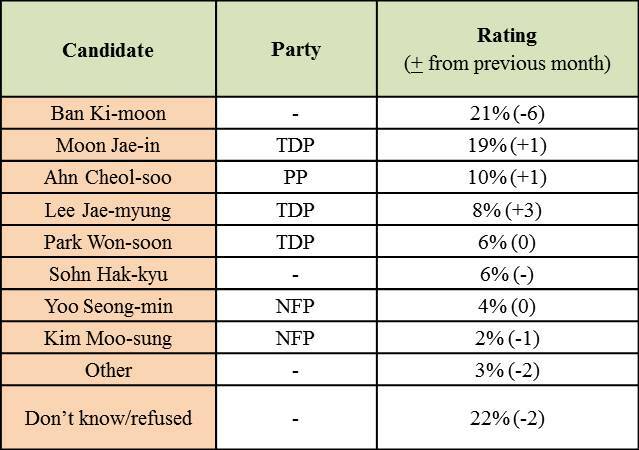 President Park’s approval rating dropped to the lowest level for any president at 5%. She has offered two public apologies in the span of two weeks. On Nov 12, approximately one million South Koreans gathered in central downtown Seoul just a few hundred meters from the Blue House to demand her resignation. This candlelight vigil was larger than the 2008 protest against imported U.S. beef and the largest since 1987 when South Koreans demanded democratic transition10. 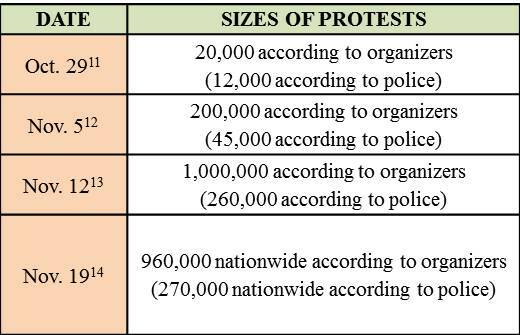 More protests are scheduled to take place during weekends and expectations are that these protests will continue to grow in size11 – 14. President Park’s response to the protests has drawn severe criticism. One questionable decision was the move to replace Prime Minister Hwang Kyo-ahn with Mr. Kim Byung-joon. When faced with strong opposition, she withdrew the nomination and visited the National Assembly to relinquish the nominating power to opposition parties. While President Park has been forced to remain silent on domestic affairs, she has been active on several diplomatic fronts. On Nov 10, she held a summit meeting with President Nursultan Nazarbayev of Kazakhstan18 and talked on the phone with US President-elect Donald Trump19. She also continued South Korea’s consultation with Japan on the information sharing agreement and on Nov 14, tentatively signed the General Security of Military Information Agreement (GSOMIA).20 Although she skipped this year’s APEC meeting in Peru from Nov 19~20, she will attend the US-ROK-Japan trilateral summit meeting in Tokyo next month21. “196명이 찬성한 ‘최순실 특겁’,” 조선일보, 2016년 11월 18일. “특검 ‘수사과정 브리핑’ 보장…의혹 실체 릴레이 공개 예고,” 동아일보, 2016년 11월 18일. 20 days for preparation, 70 days of investigation, and an additional 30 days of extension if requested. “’최순실 특검’ 내달 초 가동…박대통령 우병우도 수사대상,” 한겨레, 2016년 11월 14일. “여야, ‘최순실 특검법’ 합의…수사 기간 120일, 수사팀 60명 규모,” 중앙일보, 2016년 11월 14일. “여야 합의 ‘박근혜 특검법’ 수사대상엔 ‘박근혜’와 ‘7시간’ 없어…청와대 압수수색 못해,” 경향신문, 2016년 11월 16일. “사라진 ‘세월호 7시간’도 수사 가능…’탄핵 근거’ 제시할까,” 경향신문, 2016년 11월 17일. “檢, 최순실·안종범·정호성 기소… 박 대통령도 ‘공모 관계’ 있다,” 조선일보, 2016년 11월 20일. “유영하 ‘상상-추측으로 만든 환상의 집’,” 동아일보, 2016년 11월 21일. “정치권, 탄핵 급물살,” 경향신문, 2016년 11월 20일. “촛불 행진 85만명, 1987 민주화 항쟁 이후 최대 규묘,” 경향신문, 2016년 11월 12일. Gallup Korea, date: Nov. 8-10; sample size: 1,003; margin of error: +3.1 at the 95% confidence level. Gallup Korea, date: Nov. 15-17; sample size: 1,007; margin of error: +3.1 at the 95% confidence level. “유영하 朴대통령 변호인 ‘내일 조사 어렵다…여자로서 사생활 고려해 달라’,” 동아일보, 2016년 11월 15일. “박 대통령, 카자흐스탄 대통령과 정상회담,” 중앙일보, 2016년 11월 10일. “박 대통령 ‘한미동맹 강화’…트럼프 ‘한국과 100% 함께’,” 경향신문, 2016년 11월 10일. “군사정보보호협정 가서명…후폭풍 계속될 듯,” 중앙일보, 2016년 11월 14일. “청와대 ‘박 대통령, 한중일 정상회의 참석할 것’,” 한겨레, 2016년 11월 18일. “헌법정신은 탄핵이지만…’금기어 쏟아낸 비박’…위기의 새누리,” 한겨레, 2016년 11월 7일. “‘박대통령 모두 내려놔야’ 새누리서도 탄핵 당 해체론,” 한겨레, 2016년 11월 13일. “더민주 국민의당 정의당 ‘대통령 퇴진’ 촛불집회 참석…야권 대권주자도 총집결,” 조선일보, 2016년 11월 12일. “靑, 추미애 제안 영수회담 수용… ‘내일 양자 회담’,” 조선일보, 2016년 11월 14일. “박지원, ‘대통령이 영수회담 기다리고 있는데 갖다가 밥 넣어준 꼴…추미애가 야당 분열 노리는 청와대의 덫에 빠졌다’ 맹비난,” 조선일보, 2016년 11월 14일. “‘추미애 백기’…15일 ‘박-추’ 양자회담 철회,” 중앙일보, 2016년 11월 14일. “문재인 기자회견에 野 인사들 ‘환영’…박지원은 ‘실현 방향 모호’ 지적도,” 동아일보, 2016년 11월 15일. “‘박대통령 퇴진’ 국민의당 당론,” 한겨레, 2016년 11월 10일. “국민의당 정의당, ‘로드맵’ 제시하며 박 대통령 퇴진 총력전,” 한겨레, 2016년 11월 13일. “안철수 ‘내년 상반기엔 새 리더십 나와야’,” 한겨레, 2016년 11월 16일. “국민의당 박지원 ‘질서있는 퇴진 결단이 없다면 민심의 바다로 가겠다’,” 경향신문, 2016년 11월 13일. “박지원이 말하는 탄핵안 발의 안하는 이유 3가지는?” 중앙일보, 2016년 11월 14일. “최순실 ‘밀고’ 트럼프 ‘끌고’…韓 법인세율 어디로 가나,” 조선일보, 2016년 11월 15일. “올해 사상 첫 30조 넘는 근소세… 4년 증가폭, 법인세의 4배,” 동아일보, 2016년 11월 18일. “법인세·기업소득환류·아동수당·공익법인…’굵직한 세법 ‘1차 논의,” 조선일보, 2016년 11월 20일. “최순실 ‘밀고’ 트럼프 ‘끌고’…韓 법인세율 어디로 가나,나로조세일보, 2016년 11월 15일; 5연 3조원 싸움…여야 법인세 전쟁 시작됐다,” 서울경제, 2016년 11월 16일. “‘중간금융지주사 도입’급물살…삼성 지배구조 개편에 단비,”아시아투데이, 2016년 11월 3일; “중간금융지주에 애타는 삼성…국회선 논의조차 ‘깜깜’,”아시아투데이, 2016년 11월 16일. “중간금융지주에 애타는 삼성…국회선 논의조차 ‘깜깜’,”아시아투데이, 2016년 11월 16일. “‘최순실게이트’로 중간금융지주사제 도입 좌초 위기,” 중소기업신문, 2016년 11월 10일. 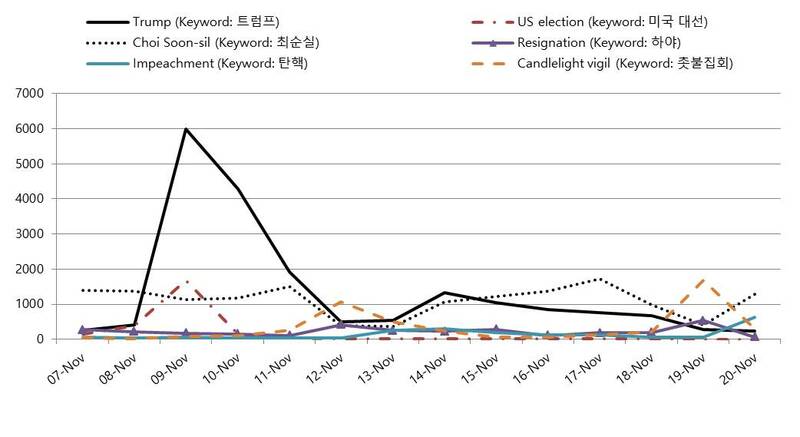 “한진해운 공중분해의 재구성, ” 경향신문, 2016년 11월 9일. “최순실에 밀린 구조조정,” 동아일보, 2016년 11월 9일.